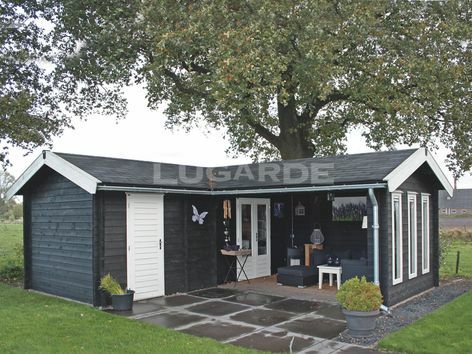 The Lugarde Siena is an extremely versatile garden building which would grace any garden. 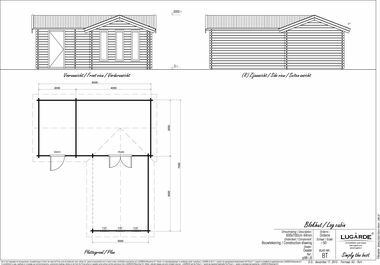 It has two rooms, one which would make a great summerhouse or studio, the other ideal for garden tools and storage. The covered, enclosed canopy just right for sitting out and enjoying your garden all year round. Overall size 6m wide x 7m deep in 44mm log thickness. The standard package includes 1 x PE45H double door, 1 x DD01H single solid door and 3 x PJ07 tall windows. The rooms measure 2m x 3m and 4m x 3m plus the canopy is 3m x 4m.